Ayurvite Wellness is one of the leading healthcare service providers in the Ayurvedic and herbal industry. We are the manufacturer of best quality Ayurvedic products and medicines. We have our own GMP certified manufacturing units located in Morena (Madhya Pradesh) and Cuttack (Odisha) of India. The Odisha based manufacturing unit (SUSAR PHARMA) is 22 years old establishment. After getting good response and name in Ayurveda market, we set a new unit at Morena (Madhya Pradesh). We are licensed to manufacture more than 300 Ayurvedic generic (shastrokta) and more than 50 patent products. We are also engaged in Ayurvedic third party manufacturing or private label manufacturing. We provide different dosage forms of Ayurvedic medicines like Capsules, Tablets (Vati/ gulika/ Gugul), Churna (powder), Syrup, Sugar-free syrup, Oils, Granules etc. 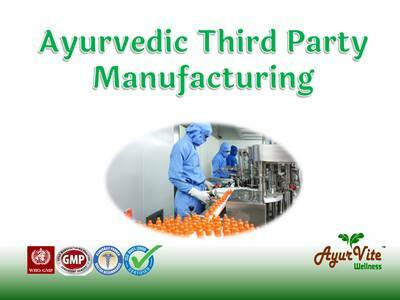 If you want to start your own Ayurvedic pharma company without investing a huge amount in setting up a manufacturing unit, we are the best choice in third party manufacturing or private label manufacturing. In this, all the products will be manufactured by us with a label of your company's name and your brand's name. We understand the financial need for a startup company. To make this easy, we thresholded our MOQ to the minimum batch size as we can do for you for Ayurvedic third party manufacturing or contract manufacturing of herbal products. *The unit size may be customized as per client's need. All range of syrup can be provided in SF (sugar-free) base. MOQ and other terms & condition may vary for international clients. Please feel free to contact us for Ayurvedic third-party export orders.